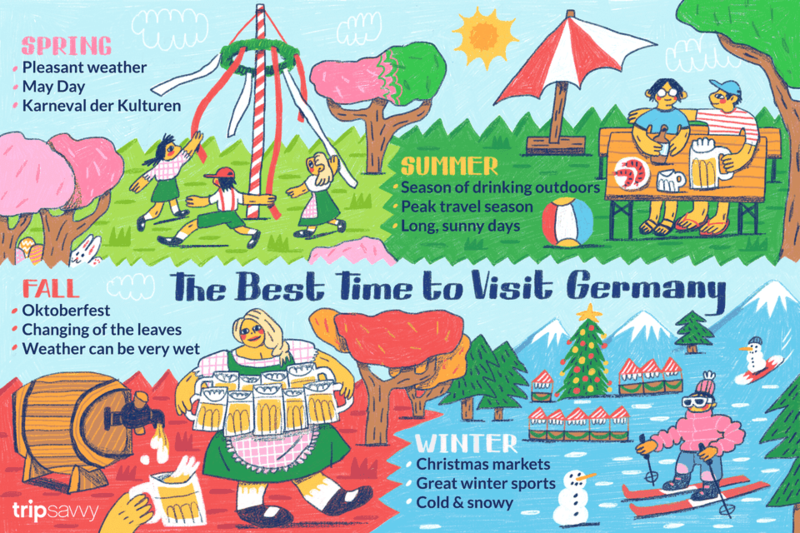 There really is no bad time to visit Germany, but the best time to visit Germany is May when the weather has finally warmed, crowds of tourists have yet to arrive, the cherry blossoms are in bloom, and Berlin has exploded into festival season. However, there are several factors that could influence when you visit Germany. While the end of a long cold winter seems to drag, it is also best for winter sports. When the world awakens in spring festivals, it is often accompanied by thunderstorms. The country is most crowded in summer before it chills to fall when it is time for Oktoberfest. And when snow begins to hit the ground, Germany is at its most charming with its many Christmas markets. Here is a complete guide to the best time to visit Germany with a month-by-month breakdown of weather, events, and festivals. The German calendar is full of events, but two major festivals draw the biggest international crowds. Oktoberfest in Munich: Oktoberfest in Munich is acclaimed as the biggest beer festival in the world. Liters of beers, miles of brats, and Bavarian culture for days, this is quintessential Germany for many visitors. The festival takes place over two weeks from late September to early October and attracts over 6 million visitors each year. Christmas in Germany: Christmas in Germany is when everything is a bit more magical. You might not realize how many Western Christmas traditions root from Germany. Along with occasional blankets of snow, the whole of Germany sparkles as weihnachtsmärkte (Christmas markets) open in every small town and city from late November through New Year's Eve. Germany's four seasons are clearly marked by changes in weather. Winter Weather in Germany: While winter officially begins in late December, temperatures have already dropped dramatically by November. Average lows dip down to 23 degrees F with highs only hitting the low 40s. Snow is fairly common, though most places miss out on the white Christmas. One thing that is for certain is rain, wind, and freezing temperatures. Invest in quality winter gear to survive the cold, particularly if you want to engage in winter sports. Spring Weather in Germany: After a long, cold winter, Germany wakes up refreshed in the spring (frühling). The air is still cool, but sunshine breaks between the clouds and temperatures rise to 40 to 65 degrees F. Rain is still frequent, and with the warmer weather in late spring, there can be epic storms of thunder and lightning. Don't forget your umbrella (regenschirm)! Summer Weather in Germany: All of Germany rejoices in summer. Temperatures are usually between 65 to 75 degrees F, but can get downright hot. On days that peak 100 degrees F with high humidity, everyone enters the water—lake, beach, water park, or open-air pool (friebad). This is crucial as almost nowhere in Germany has air conditioning. Fall Weather in Germany: Autumn (herbst) offers a welcome cool down from the warmth of summer. Temperatures range from the low 40s to high 50s until late November when the temperatures really start to plummet. Be prepared for early snow, windy days, and more rain. Summer in Germany is peak travel season. While many Germans go on holiday over the warmer months, often coinciding with the summer school break, this is the high time for visitors. Transportation will be more crowded, accommodation prices skyrocket, and airfare is at its highest. That said, it is still a great time to visit. The weather is at its most enjoyable and festivals abound. Hiking, swimming, and enjoying the country's many biergartens are a key to summer fulfillment in Germany. There are two more mini-peaks that occur along with the prime festivals of Oktoberfest and Christmas. Be prepared for similar crowds and higher hotel prices during those dates. The after-Christmas slump is real in Germany and this is a quiet, if cold, time to visit. However, it still has its attractions. Prices during the off-season (which continue until about May) are quite low so this can be a great discount time to visit. Events to check out: Three Kings Day (Dreikönigsfest) or Epiphany is on the 6th for Bavaria, Baden-Wuerttemberg, and Saxony-Anhalt. Berlin Fashion Week is another major event mid-month. Winter hibernation largely continues outside of the ski slopes and Berlin's international film festival, Berlinale. But the biggest party is for Carnival in Cologne. Men, women, and children don silly costumes and party for a week of events before Lent. Though the first day of spring happens this month, it is still chilly. However, some people are already stepping back into the outdoors with the help of strong beer. Events to check out: Starkbierziet (strong beer season) in Bavaria has been described as the “insider's Oktoberfest" and offers many of the same elements at half the price with a fraction of the tourists. Spring fairs mean that it is starting to feel like spring as the weather finally warms. Events to check out: Cannstatter Wasen in Stuttgart and Dippemess in Frankfurt are two of the biggest spring fairs.This is also the month Easter usually occurs so look for hand-decorated eggs (sometimes hanging on trees) and lots of chocolates. This month ends with a bang for Walpurgisnacht when the witches come out to dance around the bonfire. Germany sings when the cherry blossoms appear in bloom. Visitors and locals walk the flower-filled paths and enjoy one of the most beautiful months in Germany. This is just before peak season so prices have yet to spike and crowds are still fairly low. Events to check out: There are some premier events like Ertser Mai's chaotic celebrations of labor, the fireworks of the Rhine in Flames, rowdy parties for Father's Day, and the foodie delights of white asparagus (spargel) and fruit wines. Sommer is in session by June. Enjoy warm temperatures, long, sunny days, and maximum relaxation. Biergartens are now fully open, as are outdoor pools and lake-side beaches. Also remember that summer pleasures translate to the highest airfares and hotel rates as well as long lines for major attractions. Events to check out: Karneval der Kulturen, Berlin's large festival of cultures, usually occurs this month. For something by the sea, Kieler Woche is one of the largest sailing events in the world. July brings more summer festivals and sunshine fun. Events to check out: Christopher Street Day (Gay Pride) usually happens this month with the biggest celebrations in Berlin and Cologne. Laid-back summer vibes continue, including unexpected closures of businesses. Many people leave on vacation and simply shut down while they are away. That doesn't seem to stop millions of people from flooding into the country. Crowds are at a peak during this month so expect museums, public transportation and events to be quite crowded. .
Herbst (fall) begins with the changing of the leaves and many local wine festivals. And as temperatures drop, so do airfares and hotel rates. Except for the dates of Oktoberfest. If you visit Munich during Oktoberfest, be prepared for high prices on all accommodation. Events to check out: The highlight of fall in Germany is undoubtedly Oktoberfest when more than six million visitors from all over the world flock to Munich to drink beer and eat sausage. If you like wine, make sure to stop in the town of Bad Dürkheim, which hosts the ​ Wurstmarkt, the world's largest wine festival, each September. It is all about the pumpkins and Federweisser (feather wine) this month. Events to check out: The Ludwigsburg Pumpkin Festival includes giant pumpkin carving and boats made out of massive gourds. Tag der deutschen Einheit (Day of German Unity) is a national holiday every October 3rd. Also try and attend the Festival of Lights in Berlin and the Frankfurt Book Fair. November temperatures and crowds are at an all-time low before the rush of Christmas. Events to check out: St. Martin's Day (Martinstag) is a celebration for children where they decorate their own lanterns and parade through the night. The earliest Christmas markets open by the end of the month. Winter in here and Christmas is in the air in December. Among the many traditional events and markets, Germans celebrate each advent quietly at home with family. Check out Dresden and Nuremberg for two of the most historic Christmas markets. Events to check out: Round out the year with an all-out New Years Eve (Silvester) party. Official celebrations take place in most cities with professional displays, but that doesn't stop revelers from lighting their own fireworks on every street corner. If you prefer something quieter, try to escape to the countryside. Is Fall a Good Time to Visit Germany?